RECENTLY the whole nation witnessed an unprecedented robustious reaction from ruling party senior ministers and parliamentarians from the opposition also hours after the High Court Division declared, the 16th amendment that had empowered the parliament to remove a Supreme Court judge on grounds of misconduct and incapacity, unconstitutional and void on 5th May. Experts and academicians believe, this unexpected reaction will surely jeopardize the countries long desired independence of judiciary which was guaranteed by the Constitution of People’s Republic of Bangladesh. But the fact is that the Constitution, as the solemn expression of the will of the people, the supreme law of the land, has authorised the country’s highest court to declare null and void of any law inconsistent with this Constitution (Art 7 (2). With this empowerment, the High Court Division has scrapped the 16th Constitutional amendment after being thoroughly examined the said Constitutional amendment. Article 26 has also given a specific borderline about the inconsistency of any law with fundamental right’s chapter described from article 27 to 47A. Article 26 (1) reads, “All existing law inconsistent with the provisions of this Part shall, to the extent of such inconsistency, become void on the commencement of this Constitution. That means the State shall not make any law inconsistent with any provisions of fundamental rights chapter, and if any law so made shall, to the extent of such inconsistency, be void. The inner meaning of these two articles of the constitution is nothing but that has given its guardianship to the Supreme Court. The Supreme Court has also been given the power of judicial review by article 102 of the constitution. In exercise of the power of judicial review, the apex court can strike down any law for inconsistency with any provision of the constitution. And in exercise of this authority, the apex court has scrapped some constitutional amendments and some other legislations enacted by the parliament. This means our parliament cannot make just any amendment to the constitution with two-third majority. Our constitution has defined the boundaries of the three organs of the state. Our parliament is empowered to enact laws, but it can not make or unmake any law at its will. It is to abide by the constitution to make laws. If any law contradicts any provision of the constitution it will be rendered void by the Supreme Court. As the parliament has made the 16th amendment, by abolishing Supreme Judicial Council prescribed in art 96 (3) of the Constitution, that had empowered the parliament to remove a Supreme Court judge on grounds of misconduct and incapacity that amounts to the violation of article 22 of the Constitution. This article prescribes the separation of Judiciary from the executive body. If the empowerment of removing any Supreme Court Judge goes to parliament that means the power goes to a single person who is the chief of ruling party in the present context of Parliamentary democracy in Bangladesh. That means it is a crystal clear empowerment that goes to upon the executive body indeed. For this, the 16th Constitutional Amendment Act might be the main hindrance for maintaining separation of judiciary from executive that is amounting to the violation of the constitution. It might be inconsistent with the basic spirits of Rule of Law that is described in article 27 in broader sense. Though article 22 is not judicially enforceable by it’s nature as it has been inserted in fundamental principle of state policy chapter. But the article has the decisive value to make any law and constitutional amendments. And it is also noted, the insertion of article 7(b) by the 15th Constitutional amendment, the article 22 has been treated as basic structure or provision of this Constitution, hence it is not be amendable at any situations. And it is also apprehended that the existence of article 70 of the Constitution might make the SC judges as ‘henchmen’ of the ruling party chief. By the exercise of this article, no Member of Parliament can cast his vote against his own party’s decision. Hence the HC in its verdict has made some significant observations on article 70. According to the HC observations, “this article has fettered the members of parliament and it has imposed a tight rein on them. Members of parliament have no freedom to question their party’s stance in the parliament, even if it is incorrect.” It is the article 70 which has long been blamed for curtailing freedom of MPs. If our MPs now want to see a really independent parliament, then a fresh debate should start on how to remove the restrictions on them. And, let’s have a look on ‘whimsical’ as well as ‘unprecedented’ reaction from political quarters. Most of the judicious citizens believe that the HC did everything within its jurisdiction empowered by the Constitution. But the reaction of some ministers and MPs against the nullification of the constitution’s 16th amendment took observers by amid surprise. No such reaction was seen in the case of nullification of three other constitutional amendments in the last one decade. 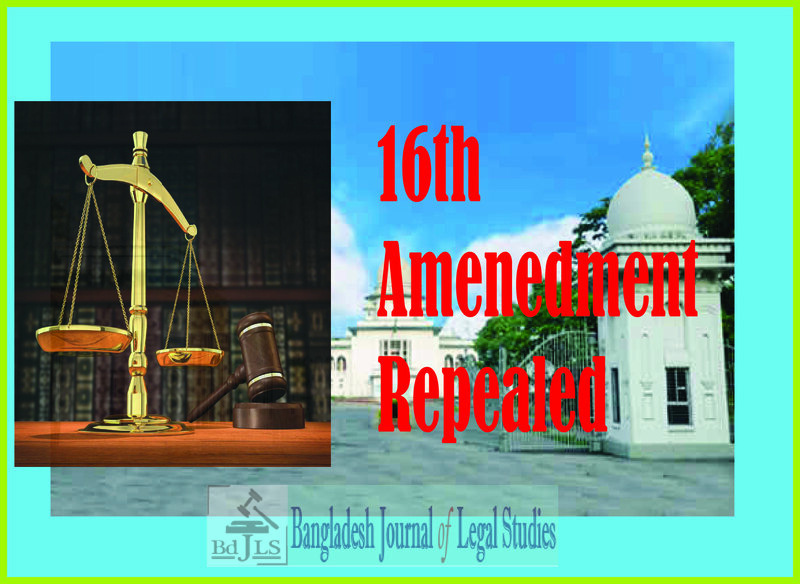 The Awami League has never blasted the apex court for scrapping three previous amendments—the 5th, the 7th and the 13th– to the constitution. They welcomed all the above nullifications. But the AL-led government however did not take kindly the nullification of the constitution’s 16th amendment by the High Court. Some ministers and MPs launched a blistering attack on the judiciary in parliament immediate after the 16th Constitutional amendment verdict taking advantages of immunity from Parliament. The way they criticised the HC’s verdict is not healthy for the proper functioning of the three organs of the state– legislative, executive and the judiciary. The attack rather exposed an aggressive attitude of the legislative towards the judiciary that is amounting to jeopardize the Judiciary’s Independence. This is quite unhealthy for proper functioning of all three organs and this will not have any positive result for any of them. In their attacks on the judiciary, they claimed that the HC verdict had humiliated and undermined the parliament. Even the law minister, an eminent jurist also, called the judgement unconstitutional and questioned the court’s jurisdiction to deliver the verdict. That is a matter of great surprise that law minister doesn’t know the jurisdiction of HC. It is true that their claim, however, is largely rhetorical. The constitution says something different by which some provisions have been depicted in previous paragraphs. And most important thing is that considering the sensitivity and importance of the judiciary, the constitution guarantees its independence. It also says, judges will be independent to discharge their functions, according to article 94 (4) of the constitution. Even in the parliament, an MP should not make any statement or comment which may undermine the independence of the judge of the Supreme Court, according to section 270 (iii) of the rules of procedure of the Jatiya Sangsad. So the MPs’ immunity under article 78 of the constitution in respect to their speeches in the parliament on judiciary is not unqualified. Though, the constitution does not mention any such significant things for ministers and MPs, it is believed that the Parliament, a quasi-judicial body can take actions against those ministers and MP’s for violating rules of procedure of the Jatiya Sangsad. And let’s have a look on their allegation in a different perspective. If we consider that their allegation towards the HC’s jurisdiction is justified, then they had another way to have remedy from the Appellate Division seeking declaration of the HC’s verdict ultra-vires. But they didn’t do so. And though, the HC’s verdict is not final. If the HC overstepped its jurisdiction in declaring the verdict, this can be corrected by the appeal heard by AD ( Read highlights of the judgment of Appellate Division on 16th Amendment). This is the legal procedure. But they reacted without following the legal way. From the above reaction, it may be presumed to us, the way they criticised that indicates they have no respect on judiciary or they want to create advance pressure on Appellate Division to get the verdict in favour of them! M. A. Sayeed Shuvo, an M.Phil Researcher of Institute of Bangladesh Studies has completed his LLB (Hons) and LL.M with 1st class 4th position from the University of Rajshahi. He is currently working as a researcher of ‘Lawyers Bangladesh’, a leading law firm in Dhaka and also working as an apprentice Lawyer in Bangladesh Supreme Court. He is also an independent consultant. He can be reached at sayeedlaw@gmail.com.